The Community Impact Solutions Team develops and delivers cutting edge information to support community based organizations’ high impact HIV prevention. We offer interactive in-person and online training events to enhance your organizational capacity to provide effective and efficient prevention with positives, prevention with high risk negatives, and HIV testing. All of our events are free and our CBA specialists are available for follow-up one-on-one consultation. If you missed it live, you can find it here! How can we can incorporate diversity and inclusion through the messages and interventions we value and educate in our communities? How can we support diverse communities, in particular communities that have been marginalized and excluded in the past? Many communities have not had access to or may not be reached by mainstream HIV prevention messages. National Native HIV/AIDS Awareness Day is a great opportunity for all of us to think about how we can make our HIV prevention messages diverse and inclusive. The NNHAAD committee has implemented a diverse and inclusive framework that models an important way to adapt messages to increase their uptake. Check out this short webinar to learn more! The webinar series objectives are to introduce wellness practices, enhance organizational development, support competency, identify best practices, support engagement strategies, increase awareness, and strengthen integration of holistic services in organizations providing services to BMSM. This webinar is presented by Community Impact Solutions, in collaboration with UWPHCBC and CARDEA, and is the fourth in the four-part webinar series, "Exploring New Opportunities for Payment of HIV Prevention Services". Get ready for CDC's funding announcement PS15-1502! Presented on December 4, 2014. This webinar is presented by Community Impact Solutions, in collaboration with UWPHCBC and CARDEA, and is the third in the four-part webinar series, "Exploring New Opportunities for Payment of HIV Prevention Services". Get ready for CDC's funding announcement PS15-1502! This webinar is presented by Community Impact Solutions, in collaboration with UWPHCBC and CARDEA, and is the second in the four-part webinar series, "Exploring New Opportunities for Payment of HIV Prevention Services". Get ready for CDC's funding announcement PS15-1502! Presented on November 6, 2014. This webinar is presented by Community Impact Solutions, in collaboration with UWPHCBC and CARDEA, as the first installment of a four-part webinar series, "Exploring New Opportunities for Payment of HIV Prevention Services". Get ready for CDC's funding announcement PS15-1502! Presented on October 28, 2014. This webinar provided an overview of collaboration in the evolving landscape of HIV prevention and care. This was developed as part of the CDC-DHAP pre-application training series to support CBO in their response to Funding Opportunity Announcement PS15-1502. Presented on October 24, 2014. The goal of this webinar was to understand the factors involved in supporting clients to remain in care and identifying new strategies to increase quality outcomes and support the HIV Treatment Team’s ability to implement and measure retention. The webinar also reviews the steps involved in the CIS Retention Readiness Indicator Tool. Presented on October 17 & 31, 2014. The Importance of Creative Partnerships between CBOs and Clinical Sites addressing HIV in the Black Community. This webinar highlights the importance of creative partnerships between CBOs and Clinics addressing HIV in the Black community. Featuring Dr. Hyman Scott (UCSF Positive Care Clinic, San Francisco). Presented on April 16, 2013. Evaluating the Impact of Facebook and other Social Media on your HIV Programming. 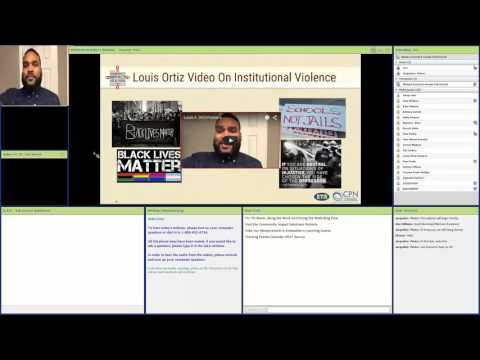 This webinar addressed utilizing social media to enhance HIV Programming. Presented by BA Laris and Carnelius Quinn from ETR. Supporting Clinicians to Create Positive, Engaging and H.I.P. Outcomes. This webinar showcases different ways of thinking about measuring and evaluating cultural competence in order to strengthen patient retention. Presented on December 12, 2012. This webinar highlights the realities of becoming a Federally Qualified Health Center (FQHC) and features the CBA FQHC Assessment Tool. Presented by BA Laris and Carnelius Quinn. Presented on November 14, 2012. This webinar discusses the role of Spirituality in HIV Services for Black MSM. Featuring Rashaan L. Nowell (St. Hope Foundation, Houston) and Javarre Wilson (Black Coalition on AIDS, San Francisco), on October 11, 2012. Presented on October 11, 2012. The objectives of this webinar were to enhance knowledge of the usefulness of situational analysis tools, understand techniques required to conduct a situational analysis, and identify ways to utilize knowledge gained from situational analysis. Featuring BA Laris and Carnelius Quinn. Presented on February 29, 2012. The objectives of this webinar are to enhance knowledge of the usefulness of the logic model, improve skills to write statements for components of logic model and improve skills to write SMART objectives. Presented by BA Laris. Presented on January 18, 2012. The objectives of this webinar were to increase knowledge about collecting evaluation data, improve knowledge about different types of data collection methods, and enhance comfort with how to implement four data collection methods (surveys, focus groups, logs and observations). Presented by Carnelius Quinn and BA Laris from ETR. Presented on November 8, 2011.